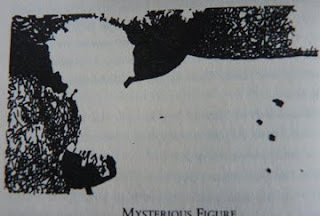 I am reading "Buddhism Plain & Simple" by Steve Hagen and on page 28 he's talking about seeing and gives us this image that he says when we "see" it, we'll know what it is ... no wondering or thinking it might be something ... we'll know it. He says to give yourself time to see it. Well, I gave myself several hours yesterday, slept on it and looked at it this morning ... still nothing. I am determined to wait till I do see it ... so please don't tell me if you know what it is. No clues, either, please. What I do want to know is how many of you see it right away and, if not, how long it takes you to get it. No spoilers please!!! But insights or thoughts on seeing would be definitely appreciated. BTW ... so far, I really like this book. I have to admit, I saw something right away, Joyce. Now, whether it's what others see is something else again. In case anyone is interested, one may read chapters from the book at GoogleBooks. Hagen can be found at the Dharma Field Zen Center site, too. K -- so I visited yesterday. Watched and looked and viewed and 'saw' something. Actually many things. that's the thing about visiting your blog. I always meet the unexpected, the unseen and the seen but not seen in that way before! Thanks my friend for always charging up my sight and my thinking!